If you want to "be green" and save money this year with your holiday or year-round lighting project then LED rope lights are the solution for you. LEDs are cutting edge technology because there is no filament to heat in order to make light, which means they are energy efficient, produce less heat, last longer, and generate a richer, brighter light than traditional bulbs. 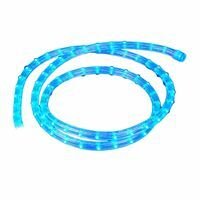 The rope lights' highly durable PVC tubing also makes it ideal for indoor and outdoor use. NoveltyLights, Inc. uses a vertical bulb so that the LEDs point out of, rather than down, the line of rope light -- resulting in a greater angle of illumination that is more eye-catching and impressive. Choose from 7 colors -- Warm White (our most popular), White, Cool White, Red, Blue, Green and Amber. 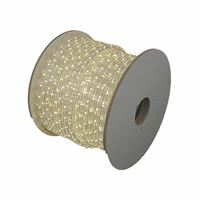 We have over 10 years' experience selling LED rope lights so we are the experts!